There still isn’t a mention of the rumored 64-bit Exynos Infinity, but Samsung announced the revision to the Exynos 5420 at the Mobile World Congress. The Exynos 5422 comes with the same architecture as the Exynos 5420, but features higher clocks. There is still the 4+4 combination of Cortex A15 and Cortex A7 cores, with the Cortex A15 cores clocked to 2.1 GHz while the Cortex A7 cores are clocked to 1.5 GHz. This is very likely the SoC that will be featured in the octa-core version of the Galaxy S5. In addition to higher clocks, the Exynos 5422 features a new hibernation algorithm that increases efficiency and a new mobile image engine that reduces memory bandwidth. The Exynos 5422 comes with Heterogeneous Multi Processing, which means that a combination of any cores can work in conjunction, or all eight cores can run simultaneously if a workload requires it. The Exynos 5260 is a hexa-core offering that comes with two Cortex A15 cores clocked at 1.7 GHz and four Cortex A7 cores at 1.3 GHz. The SoC also has Heterogeneous Multi Processing, which means that all six cores can work in tandem. It also comes with H.264, MPEG4 and VP8 codecs that allows for full-HD video playback at 60 fps. The Exynos 5260 has a memory bandwidth of 12.8GB/s, which allows it to support WQXGA (2560 x 1600) display screens. Both the Exynos 5422 and Exynos 5260 are built using a 28-nm manufacturing process at Samsung. 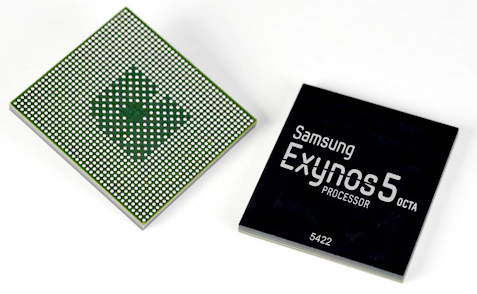 The Exynos 5260 is currently in mass production, while the Exynos 5422 is scheduled for production later this quarter.